He began by drawing with pieces of charcoal on the walls of his home in Goa, much to the annoyance of his grandmother. “Exasperated, they got me a notebook and pencils and asked me to draw away to my heart’s content," says cartoonist Mario de Miranda. Soon thereafter Miranda became famous for carving on desks at the St Joseph’s Boys High School in Bangalore, where he did his schooling. “I did get a few frowns for carving on the desks, but luckily nobody ever discouraged me," he adds with a chuckle. Starting today,The World of Mario, an exhibition that chronicles Miranda’s oeuvre right since 1947, will be showing in Bangalore. On display, will be 8,000 panels of his works—ranging from the sketches he drew as a child to cartoons and drawings published in magazines to works exhibited at international exhibitions. 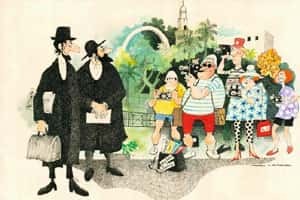 Speaking over the phone from his ancestral home in Goa, where he now lives with his wife and younger son, the 83-year-old cartoonist confesses to feeling diffident about his work to this day. “I find it a bit embarrassing to be exposed to the public eye, frankly," he says. “I used to sketch in these diaries whenever I had a chance. A number of them were meant to be private." Miranda says he has always seen himself as a social cartoonist rather than a political one, even when he was associated with mainstream news publications such as The Economic Times and The Illustrated Weekly of India. “I enjoy drawing, but don’t enjoy politics at all," he admits. “I enjoy observing people, getting to know them and drawing out their behaviour, but then I am aware that I cannot avoid politics. It is, after all, part of our daily lives." Translating thoughts and humour into sketches came naturally to Miranda, who is glad that he gave up plans to attend art school. “When I think of it now, I am sure art school would have ruined my style," he says. Among his major influences he counts the English artist Ronald Searle, who he met when he was in England for three years in the late 1950s. Integral to his distinctive style is his emphasis on architectural detail. “Travelling gives me most of my food for thought," he says. “I read buildings, the culture of places, the expressions of faces." Characteristically full of expression and gentle humour, Miranda’s works adorn many public places in his native Goa as well as Mumbai. These days Miranda is trying his hand at something new—painting. He is careful to point out that he isn’t a natural at it and that his first love will always be drawing. Miranda’s works will be on sale at the Indian Cartoon Gallery, off MG Road, from 3-24 October. The cartoon panels start from Rs3,500.